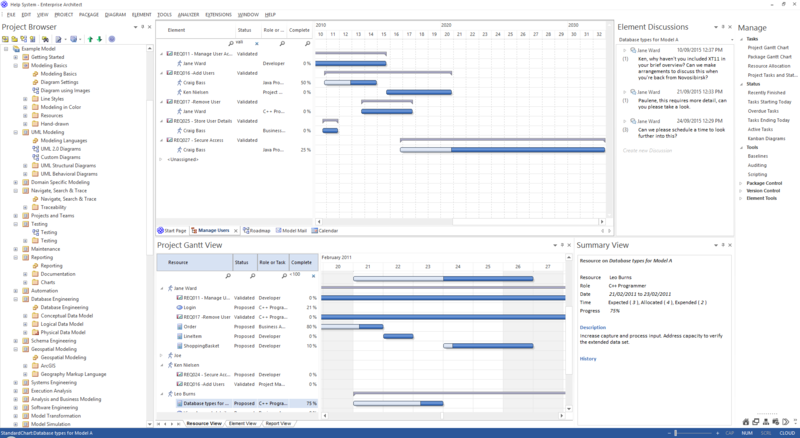 In Enterprise Architect, you can visualize elements and assigned project resources in a Gantt Chart format, to review the breakdown of work for a specific project and for specific sections of the project. 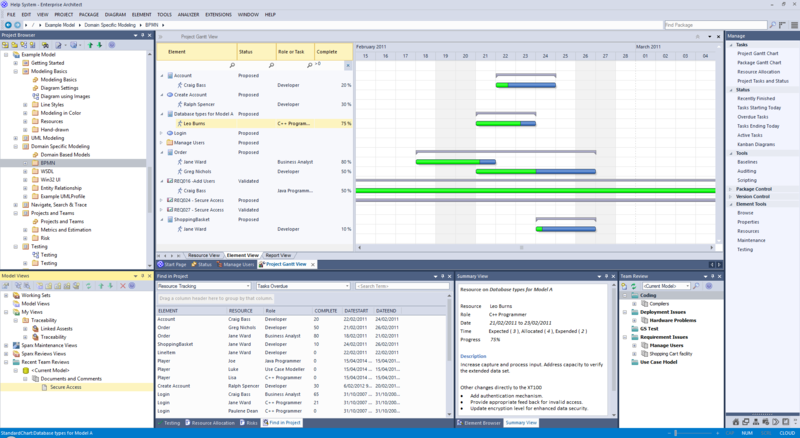 The Project Gantt View illustrates a project schedule by showing the start and finish dates of assigned resources, so that a Project Manager can quickly see the current project status using the percent-complete bar shading and the percent-complete, resource name and status columns. Information can be filtered, and overdue items can quickly be highlighted and identified. 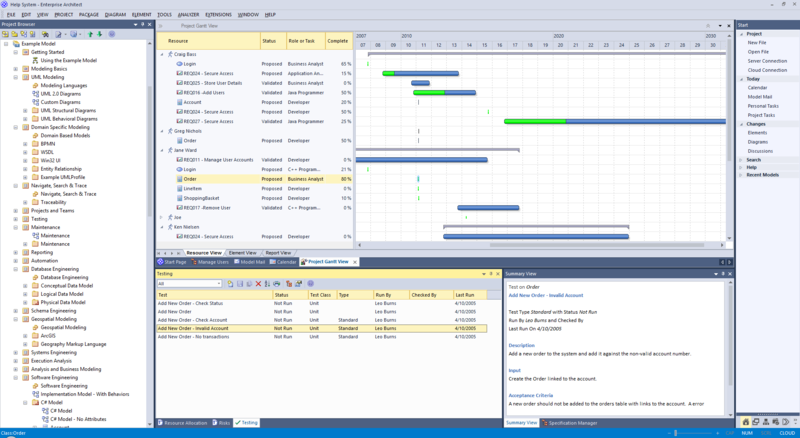 You can also access specialized versions of the Gantt View from diagrams, Packages and the Personal Tasks list. This collection of images highlight some key features of the Gantt View and how it can interact with other tools in Enterprise Architect. This example shows four resources, two of whom are working in different capacities on one task, and two on another task. The resource names and roles are listed in the left panel of the chart, together with the actual percentage completion of each person's work on the task. In the right panel of the chart, completed work is indicated by the green section of the bar, work yet to be completed but not yet due is indicated in blue, and work not completed and overdue is indicated in red (as a result of the option to highlight overdue work being applied). When you initially open the Gantt View, it defaults to the 'Resource View' tab, in which the focus is on the current commitments of each allocated resource in the project. The Element View lists the elements in the project that have resources assigned to them, and the resources assigned to each element. A Resource report shows how your resources are deployed in your project, displaying a list of all elements that have resources allocated to them. 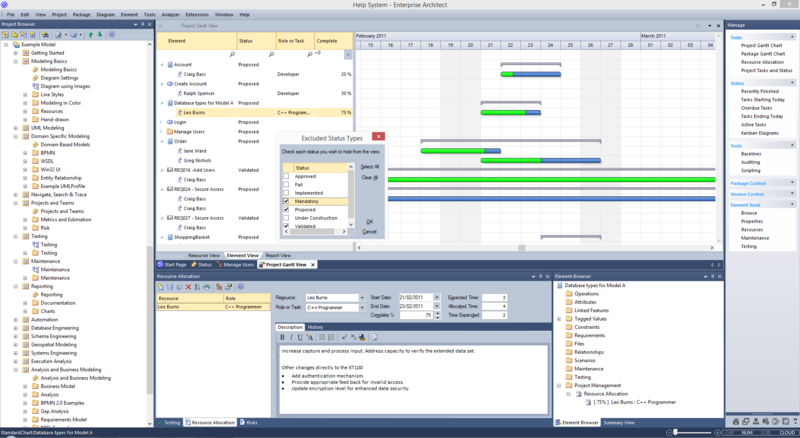 The facilities of the Project Gantt View are common to the Resource and Element Views, and in some cases to all three tabs, as described here. Right-click on the element entry and select the 'Show Element Properties' option. The 'Properties' dialog for the element displays. Right-click on the entry and select the 'Show Task Properties' option. The 'Assigned Resources' dialog displays; you can edit the details and, if necessary, change the resource allocated to the element. The 'Resource Allocation' window displays, with the details of the selected entry shown in the fields and the other resource allocations for the element listed in the left-hand panel. You can edit the details and, if necessary, change the resource allocated to the element. Right-click on an element in the display, and select the 'Assign Resource' option. The 'Assigned Resources' dialog displays; complete this as for the 'Resource Allocation' window. By default, the Gantt Chart shows periods of time in units of days of the month, each date column being approximately one centimetre wide. Weekends have a darker fill color. This allows you to represent a wide range of tasks on a single chart and to condense or expand the view - in conjunction with filters - to investigate the short term and longer term work clearly. You might want to make broad adjustments to the timeline of an event, which you can easily do on the Gantt Chart itself. For example, the resource is ill, or another resource has taken over other tasks that the resource was allocated to. In neither case has the task itself changed, but in the first case the resource needs a longer elapsed time in which to complete the task, and in the second they have less other work to do and can finish the task sooner. To make these adjustments, you simply drag the right end of the time bar further or back along the chart. This changes the task end date to wherever you drag the time line to, and adjusts the division into complete and incomplete/overdue work to maintain the percentage completion value. The work time allocated to the task does not change. If you drag the left end of the time line, this moves the whole line without changing its length or proportions; you are just indicating that the task started earlier or later and will finish earlier or later by the same amount of time. A resource is likely to be allocated to several tasks either simultaneously or consecutively. In the Resource View the tasks assigned to a resource are grouped under the resource name, and a narrow group bar displays in gray on the chart against the name, spanning the period from when work is scheduled to begin on the first task to when work is scheduled to finish on the final task. Similarly, a body of work, represented by an element, might involve several resources starting and finishing at different points. The resources are grouped under the element name and the group bar displays on the chart against the element name, spanning the period from when the first resource is scheduled to start work to when the last resource is scheduled to complete work on the task. If any adjustments are made that impact the initial start point or final completion point of the work, the end of the group bar automatically adjusts. If any task or resource in the group is overdue, the group bar turns red to reflect that there is a potential problem in the allocated work. Right-click on the window and select the 'Apply Element Status Filter' option. The 'Excluded Status Types' dialog displays; select the checkbox against one or more statuses to exclude elements having those statuses from the list. You can select every checkbox at once by clicking on the Select All button, and clear all selections by clicking on the Clear All button. Click on the OK button to immediately apply the filter, which stays in effect until you specifically change it. Right-click on the list and select the 'Show Filter Bar' option. The Filter Bar displays underneath the heading bar. Type a text string in the field above a column to immediately filter the list for entries that have the text string in the values in that column. To delete a filter string altogether, click on the blue cross at the right of the field. If you no longer want to use the filter bar, right-click on the list and select the 'Hide Filter Bar' option. Right-click on the display and select the 'Show Overdue Items Only' option. The display shows only those items for which the end date has passed but that are not 100% complete. These items do not have red highlighting. Right-click on the entry and select the 'Refresh' option. The content of the display is refreshed and collapsed to element or resource level. Right-click on the display and select the 'Go to | Auto Sync with Task End Date' option. Whilst this option is selected (with a tick next to it), whenever you click on an allocation the display adjusts to show the end date of the task in the center of the chart. The display shifts to put the required date in the center of the chart. (Also available in the Report View.) Right-click on the element name and select the 'Find in Project Browser' option. The area of the Project Browser containing the element is brought into focus and expanded, and the element is highlighted. Right-click on the resource or one of their activities and select the 'Post Model Message' option. This opens a Model Mail message addressed to the resource, for you to complete and send. Right-click on the tab and select the 'Save Image to File' option. The 'Save As Image' dialog displays, on which you specify the file name, location and graphics file type to save to. Right-click on the tab and select the 'Copy Image to Clipboard' option. You can paste the image from the clipboard into your preferred graphics package.